Boxing is one of the best full-body workouts you can sweat through, and more women are boxing their way into enviable shape. If you’ve been nervous to try this calorie-shredding modality of exercise, we can tell you that after one session of muscle-toning boxing moves, you’ll not only feel empowered, you’ll be ready to make boxing fitness part of your body-sculpting regime. After you watch a bout of women boxing in the ring or even observe a boxing class, if you haven’t actually been in the thick of it, you might think there is no way you, too, could box your way into shape. If this is you, guess what? 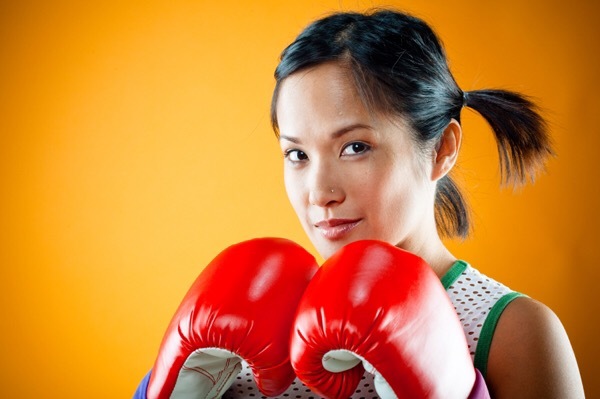 After your first boxing lesson, all of that nervousness and self-doubt will be gone. You will actually feel empowered to learn something that seemed so out of reach only an hour prior. Though boxing was once solely a sport and activity practiced in dark and dank gyms that allowed only men to “join the club,” nowadays there are many less intimidating locales and women are a strong part of the membership. Most boxing facilities now have a 50/50 ratio of women to men. Because boxing offers an all-over-body workout (conditions every muscle in your body, including your heart and lungs), is cognitive (keeps the mind sharp and engaged), reduces stress (gets aggressions out on the punching bag) and teaches self defense (something all women should know a little about), it is now the workout of choice for women of all ages and fitness levels. And, yes, you, too, can join the boxing club. As you may know, jumping rope is a big part of boxing training. So what’s to be nervous about? You got this! You did the Double Dutch no problem back in school. I don’t remember too many boys out there skipping rope during recess. Do you? Remember play day at the end of the year in elementary school? All of the different activities with your peers and the fun you had competing for the blue ribbon! A great boxing program will offer a multitude of activities and new workouts on a regular basis. And competition? Even though you and your comrades in class will encourage each other, you will still compete with one another on an unspoken level; hitting the bags harder or faster, doing more sit-up, push-ups, etc. As women, we are very analytical. Boxing requires a lot of thought in order to throw one simple punch. You’ll love this: Women tend to “perfect the punch” quicker than their male counterparts because of their analytical skills. So analyze away! There was always a bully in school and even as an adult you may know a few. Boxing is empowering! If you feel like someone is pushing you around (not physically, of course), the mental strength you gain from boxing will help you take on any bully in any situation! So, you were a little different in school? Maybe not the most popular, but definitely a leader and a free thinker. Boxing is mainly an individual sport and something that not everyone will do. If you like to step away from the pack and do something different, boxing is definitely for you. You don’t have to come to class dressed in the latest workout wear, you don’t have to impress anyone except yourself and now you will be the cool kid! Too many times you get off of work and are mad at the world. Not only did you spill your $5-cup of coffee on the way to the office, your boss is on a rampage, you had to stay late to work on deadlines, and now it’s time to go to your second job — your family! You need a place where you can release all of that stress and frustration. Hit something! Yes, it does feel great to put on some gloves and go to town on the punching bag. The number of reasons why you can and should try boxing are many. Boxing is no longer an “old boys club” sport, and new boxing clubs everywhere are opening their doors to you. So take those nerves and turn them into excitement when you step through the doors of your local boxing gym. Posted in Boxing, Fat fighters 7, Fat loss, fitness, Functional training, Health, Hood river, Inside Out Fitness, MMA, Movement, Muay Thai, Parkour, Personal trainer, responsibility, running, Rustic parkourTagged #columbia river gorge, Boxing, Boxing/Functional Training Club Hood River, Children fitness, Columbia River Gorge, Columbia River Gorge, fitness, Functional training, health and fitness, Hood river, Kids fitness, MMA, Muay Thai, Personal trainer, running, Thai Boxing, the trainer, women boxingBookmark the permalink. Boxing for fitness! Let’s go Hood River and Columbia River Gorge !